Extend the time limit for submitting an employment tribunal claim – from three months to six months – in cases of pregnancy or maternity discrimination. Hmmm. Yep, I was pretty sceptical when serious people – including Equality & Human Rights Commission (EHRC) officials – first floated the idea, during the Commission’s 18-month, BEIS-commissioned and funded investigation into the extent and nature of pregnancy and maternity discrimination in the workplace. Not because I thought it a bad idea, I hasten to add. After 13 years at Citizens Advice, and having researched and written the 2013 Maternity Action report Overdue, I was aware of and understood the problem. I just didn’t think the idea would fly. Too many employment lawyers and judges would surely say ‘But what about claimants in cases of X? Shouldn’t they have six months too?’. And the Ministry of Injustice would just say ‘no’. We can’t have women accessing justice. Not in the 21st century. “Another problem for pregnant women is the time limit that precludes their taking action where there has been discrimination; action cannot be taken more than three months after the incident. I cannot recall how old your children are, Mr Chope [the Chair], but I am sure you can cast your mind back to the position three months after the birth of a child or three months after your wife might have taken maternity leave. It is a hectic time when it is difficult to think about bringing a discrimination case. There are better things to do. That month, the energetic Pregnant Then Screwed group, which had latched onto the idea at an early stage, launched a campaign with the hashtag #GiveMeSix. More than 70 MPs from seven parties – Labour, the SNP, the Liberal Democrats, Plaid Cymru, the DUP, the SDLP, and the Green Party – signed an Early Day Motion in support of the campaign call. And then, in late May, the Labour Party’s general election manifesto pledged (see p109) to “extend the time period for applying for maternity discrimination to the employment tribunal from three to six months”. The idea was definitely airborne. Sadly, of course, this and other welcome manifesto pledges – and the worst Conservative election campaign ever – were not sufficient to propel Labour into power. However, with the establishment of a hung and bung Parliament, a new Early Day Motion in support of the #GiveMeSix campaign’s policy ask has been signed by more than 80 MPs, including Labour’s Harriet Harman, Stella Creasy and Chuka Umunna, the Conservative Sir Peter Bottomley, and the Liberal Democrat former employment relations minister, Jo Swinson. It wouldn’t hurt ministers much to concede and implement the reform. 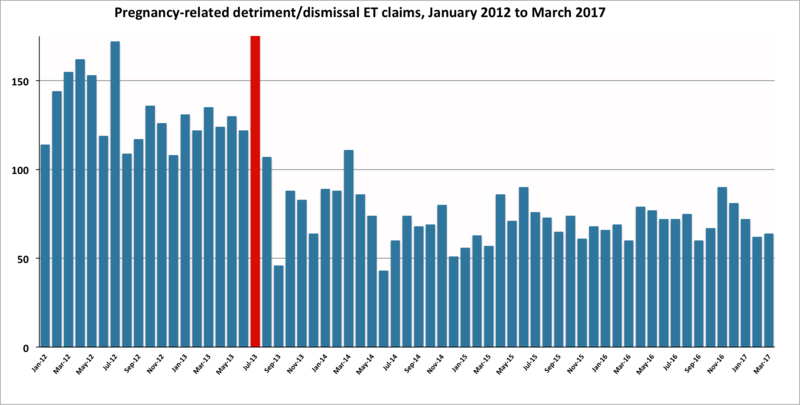 As the following chart shows, and for reasons highlighted by the BEIS/EHRC research, the number of pregnancy or maternity discrimination-related claims has never been huge, and has been even smaller since the introduction of hefty tribunal fees in July 2013. So, just as Maria Miller suggested, there’s no danger of the tribunal system being overwhelmed by a wave of new claims. But maybe it doesn’t matter. For, when it comes to unlawful pregnancy discrimination, equalities minister Claire Perry told the House of Commons yesterday that she and business minister Margot James are “absolutely determined to sort things out” and will “come down like a ton of bricks on any employer who breaks the law”. Yes, really. This entry was posted in Equality, Justice, Workers' rights and tagged Employment tribunals, Equality, ET fees, Pregnancy discrimination. Bookmark the permalink.